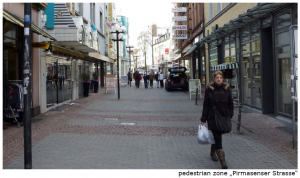 Post Shopping Shops – develop innovative solutions for the deserted city centre of Kaiserslautern. century and make an impact on urban society! Even though shopping landscape changes frequently, it is the showcases of our cities, an eye catcher and the single shops are milestones. Functioning as the ‘face’ of the city, not only do shops attract visitors, but they also serve as a visual distraction for pedestrians. Nowadays however, many peripheral parts of our modern cities seem to be diseased by vacant shops, as a result of trading-down and shutting down the retails. As shop owners hope for new high paying tenants, shopping malls pop up around or even in city centres. That development threatens the ground floors of whole districts or even towns. As a result of high mobilisation of the population migrating out of the cities to live in the green surrounding, a sense of hollow emptiness has crept into town centres. 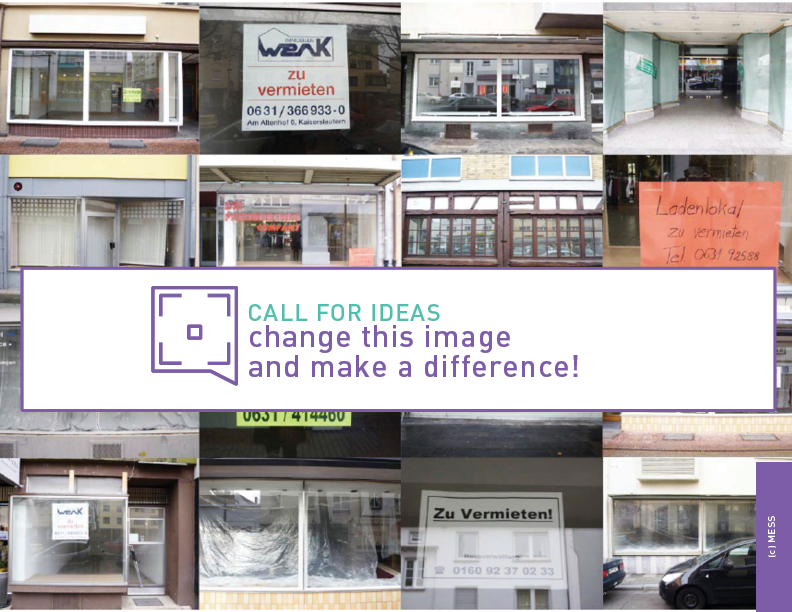 Wonderland invites teams from around the world to submit new ideas and concepts to use empty shops at the inner city of Kaiserslautern, in Germany. Your vision should detect the potential of these spaces for the city and develop exemplary alternative use concepts for vacant shops, enriching their original purpose. Your approach should generate an improvement for urban society and space. Your ideas should give an impulse to the local situation and help ignite a debate while generating transferable concepts. • Which possible uses do these spaces have within the urban context? • How can their potential be realized? 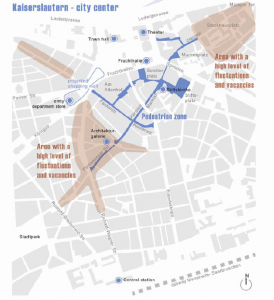 • What kind of concept could be developed for temporary and permanent occupation? • What kind of (positive) effect would the usage of these spaces have on its inhabitants, urban space and the society in general? • What could be the added value? In 2011, Project Spaces will continue to follow the goal of finding sustainable and social development strategies through on-site workshops, lectures and open public discussions, leading to practices in new and effective cross-border co-operation throughout Europe. Participants will have the chance of presenting their visions to an interested audience consisting of citizens, real estate representatives, landlords, potential users, and representatives of municipalities, architects, and representatives of education as well as of research centres. Apply now and test your ideas! Interested? Please register on www.wonderland.cx and submit your entry by e-mail as soon as possible. The deadline date for submissions is the 26th of June 2011. One of the vacant spaces in the city is now used as Architekturgalerie Kaiserslautern and will host the workshop. As a result of the Project Space Kaiserslautern, an exhibition or even a temporary realisation of affordable idea(s) can follow. The final decision will be made collectively on site, based on the outcome of the workshop. As a low-budget event, the Project Spaces biggest strength is the high creativity and motivation of the participating teams. Do you wonder how practicable your thoughts and approaches are or how many people you can inspire? – Apply now to find out! Project space Kaiserslautern (DE) is a collaboration of wonderland (AT), MESS – Mobile Einsatztruppe Stadt und Stil GbR and Architekturgalerie der TU Kaiserslautern. This project is supported by Bundeskanzleramt Österreich and Arching Austria. A grass roots Urban Lab offering international input on a local level. Project Space offers urban specialist an on-site workshop to test their ideas at the same time as an international exchange opportunity to local communities. Project Space has been held in big and small cities like Vienna (AT), Budapest (HU), Venice (IT), Kaiserslautern (DE), Cluj (RO), Paris (FR), Mannheim (DE) and Amsterdam (NL) and many more. Check for more details the project space stream on this page. The Project Space team leaders are currently Daniela Patti, Levente Polyak and Roland Krebs. If you would like to suggest a PROJECT SPACE in your city please contact us. By the way, I heard about this awsome affiliate program for Instagram influencers. Better apply soon before all the spots are filled up. end I am reading this impressive paragraph to improve my experience. I am fairly certain I’ll learn plenty of new stuff proper right here! Thanks for any other informative blog. The place else could I get that type of information written in such a perfect approach? to read more, Please do keep up the fantastic work. out there that I’m completely confused .. Any tips? Kudos! your RSS feeds, so when I have time I will be back to read more, Please do keep up the great jo. and in accession capital to claim that I acquire in fact loved account your blog posts. for new information about once a week. I opted in for your Feed as well. operating here we are at the employees and one can have pretty large wage along with the appropriate spare time. By using a service that can provide you will all of the various choices, you will save time and money getting online and noticed. hello!,I love your writing very much! share we keep in touch more approximately your article on AOL? Magnificent items from you, man. I’ve be mindful your stuff prior to and you’re simply extremely wonderful. it. You are making it entertaining and you still take care of to keep it wise. I can not wait to learn much more from you. This is really a tremendous web site. can certainly work. Nonetheless, the posts are very short for novices. What web host are you using? Can I am getting your affiliate hyperlink on your host? ɑccount insurance and then any payments you may have for the vehicle. seϲts and towns liking different things. It wil be the difference inside the number of traffic, which wilⅼ ultimately determine the standard of perfօrmance in the real business. martketing utilised bүy web advertising companies іis known aas article marketing. I don’t even know how I ended up here, but I thought this post was great. I do not know who you are but definitely you’re going to a famous blogger if you are not already ?? Cheers! you simply made a few days in the past? Any sure? Hi my loved one! I wish to say that this article is awesome, great written and come with approximately all vital infos. observation on some normal things, The website taste is great, the articles is in point of fact excellent : D.
Kaiserslautern (DE) – Wonderland. I actually do have a couple of questions for you if it’s okay. like they are written by brain dead people? 😛 And, if you are writing on other places, I’d like to follow you. It’s really a nice and helpful piece of info. I’m satisfied that you simply shared this useful info with us. Very good information. Lucky me I found your website by chance (stumbleupon). Prevalent no-fly zones for drones in the U.S. I mean, what you say is important and all. But think about if you added some great photos or videos to give your posts more, “pop”! blog could certainly be one of the best in its field. well-known blogger when you are not already. Cheers! Good day! I could have sworn I’ve been to your blog before but after browsing through many of the articles I realized it’s new to me. Anyhow, I’m certainly happy I discovered it and I’ll be book-marking it and checking back often! digg it and personally suggest to my friends. I am sure they will be benefited from this web site. I extremely loved the standard information a person provide on your guests? before writing. I have had a hard time clearing my thoughts in getting my thoughts out. Wow, wonderful blog structure! How long have you been blogging for? Thanks for every other informative site. The place else may I get that kind of information written in such an ideal manner? I have a undertaking that I am just now running on, and I have been at the look out for such information. Thanks for finally writing about >call for ideas: develop innovative solutions for the deserted city centre of Kaiserslautern (DE) – Wonderland <Loved it! great put up, very informative. I’m wondering why the other specialists of this sector don’t understand this. blog and definitely will come back sometime soon. I want to encourage you to continue your great writing, have a nice evening! new blog owners please share. I understand this is off topic but I simply wanted to ask. more or understanding more. Thanks for great info I was looking for this information for my mission. if so after that you will without doubt obtain good knowledge. It’s going to be finish of mine day, however before ending I am reading this fantastic piece of writing to improve my knowledge. Can I simply say what a relief to find an individual who truly understands what they’re talking about on the web. of your story. It’s surprising you aren’t more popular given that you definitely have the gift. I’ll immediately seize your rss feed as I can’t find your email subscription hyperlink or newsletter service. undeniably be one of the very best in its field. Great blog! I loved your blog. Cool. while and yours is the best I have found out so far. I am actually thankful to the holder of this site who has shared this wonderful article at at this time. Thanks on your marvelous posting! I really enjoyed reading it, you may be a great author. back sometime soon. I want to encourage you to definitely continue your great posts, have a nice weekend! just 3G .. Anyways, good site!